Energy efficiency levels have been established with strict requirements over the years to combat our growing consumption of energy. Mean Well has always demonstrated great quality and performance in their power supplies to be in compliance with these energy efficiency regulations regardless of the series. Their popular GS series complies with Energy Level V, and the latest GST series meets the Energy Level VI. We'll go over the Level V and VI regulations and the benefits from upgrading to the latest standards. Energy efficiency levels correspond to specific minimum active and no load quantities. For energy Level V on standard AC-DC models greater than 6 volts, the no load power requirement from 0-49 watts is less than 0.3W and from 50-250 watts is 0.5 watts. When active, the efficiency requirement from 50-250 watts is greater or equal to 87%. For 1-49 watts, [0.0626 x ln(Power)] + 0.622 is the formula, where power is the wattage listed on the label of the power supply. With less than 1 watt, the formula is 0.48 x Power + 0.140. The GS series meets all these requirements. Energy Level V standard is enforced in the European Union (EU). While the US and Canada currently enforce Level IV, Level V meets these regulations. It is a direct response to the needs of the original equipment manufacturers (OEMs) that ship globally to have a universal power supply platform. Otherwise, they may face expensive fines as different countries or regions endorse different standards. Energy Level VI not only has more regulations that vary from amount of power to type of power supply compared to the current Level V, but it also expanded the range of products it covers to include multiple output voltage power supplies and those above 250 watts. 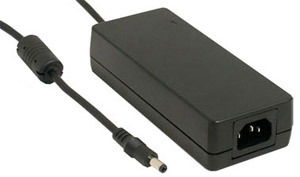 The United States Department of Energy (DOE) first published these strict standards for external power supplies (EPS) in February 2014. They mandated compliance for Level VI two years later on February 10, 2016 that cover EPS manufactured in or imported to the US or Canada. The EU is going through revision discussions but should be expected to harmonize with most of the US standards. 1. Single-Voltage External AC-DC Power Supply: An external power supply that is designed to convert line voltage AC into lower-voltage DC output and is able to convert to only one DC output voltage at a time. 2. Low-Voltage External Power Supply: An external power supply with a nameplate output voltage less than 6 volts and nameplate output current greater than or equal to 550 milliamps. 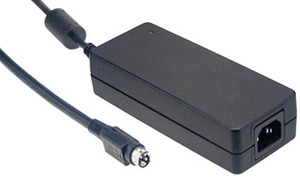 Basic-voltage external power supply means an external power supply that is not a low-voltage power supply. 3. Single-Voltage External AC-AC Power Supply: An external power supply that is designed to convert line voltage AC into lower-voltage AC output and is able to convert to only one AC output voltage at a time. 4. Multiple-Voltage External Power Supply: An external power supply that is designed to convert line voltage AC input into more than one simultaneous lower-voltage output. While the requirement date for Level VI, it's still possible to ship legacy products as long as the manufacture date is prior to the transition date. Labeling requirements are still mandatory to meet the international protocol as the current Level V standard for EPSs. There are benefits from upgrading from Level V to VI, saving energy, money, and the environment. Under the regulation, efficiency is increased by about five percent. Pretty significant in power savings when you take into account the millions of adapters in the market. With a greater reduction of power consumption, energy crises can be averted or reduced considerably. It also results in a greater savings in money owed to the utility companies. The Environmental Protection Agency (EPA) estimates that over the past decade, consumption has reduced by about 32 billion kilowatts, saving 2.5 billion dollars annually. At Level IV, it was 0.5 watts efficiency and goes down to 0.1 for Level VI, which makes the money saved plausible. It also reduces CO2 emissions by more than 24 million tons a year for less pollution to the environment. There are no downsides to upgrading, so exchange those GS supplies for the GST equivalent, and with more efficient technology, it will extend longevity as seen with longer warranties on the data sheet. The design of these EPSs have been clearly redefined for better power ICs and transformers to fit the new efficiency benchmarks. Mean Well has been ahead of the game, as well as their customers for meeting these standards before the transition date. Other companies might not have an unfit design in the middle of its lifecycle. As we look to the future, the push for Level VI will change the amount we save drastically as we move forward. Although the new regulation exempts medical EPSs, Mean Well has the GSM series that are medical power supplies that meet the Level VI criteria. They are already implementing the latest of greener technologies to comply with regulations while meeting the demands of the market. Check out the latest and greatest for yourself with the GST series.